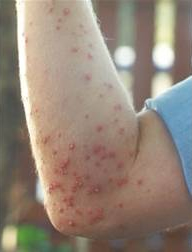 Encounters with fire ants can involve tens or hundreds of ants; they tend to all sting at once and can sting repeatedly. Stings are painful, and the burning or itching sensations can last up to an hour. Victims of multiple stings may feel as if their body is on fire. After a few hours (or even a day or two), small blisters or pustules may form at sting sites. These may become itchy and can take up to 10 days to heal. There is a risk of secondary infection if the blisters or pustules break. Apply a cold compress to relieve the swelling and pain. Gently wash the affected area with soap and water and leave the blister intact. Seek immediate medical attention if you are allergic to insect stings or experience symptoms of allergy. If you see fire ants, you must notify Biosecurity Queensland on 13 25 23 or complete the online fire ant notification form. Find out about your legal obligations if you are moving fire ant carriers in a fire ant biosecurity zones.